Hope you’re all having a lovely weekend so far – thought I’d quickly share yesterday’s outfit in a little more detail. The killer combination of wind and rain meant I found myself digging out a pair of tights for the first time in a long while. I still wanted to keep the look summery so I threw on some frayed denim shorts and a dark floral summer blouse for that British summer feel. I always tend to size up in vintage shorts as I prefer the way they look on me, and I like to add a belt to bring them in at the waist. This actually worked to my advantage yesterday as we were heading out for pancakes, and there isn’t much worse than feeling restricted when it comes to eating pancakes! 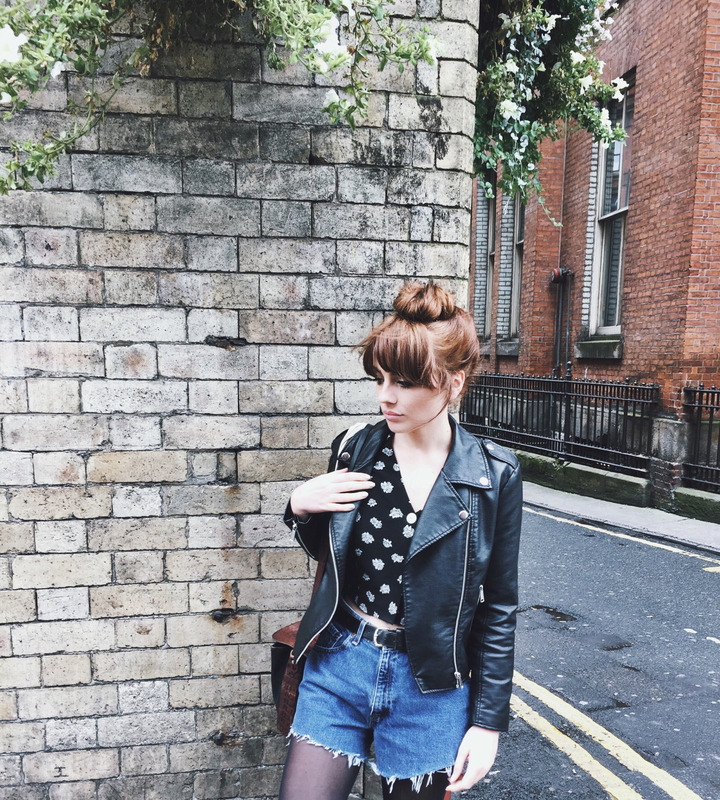 Both the top and shorts are from We are Cow which happens to be my favourite vintage shop in Manchester and always have the best array of stock. I’ve spoken about my love for them before but definitely check out their website if you aren’t lucky enough to live near one of their shops. They have some amazing pieces online, including lots of branded vintage and accessories. The jacket was a recent birthday inspired investment, and I’ve pretty much worn it every other day since getting my hands on it. It’s the perfect leather jacket for me because it’s not fussy, it doesn’t have lots of studs or tassels, and the cut is quite masculine but flattering at the same time. I’ve often tried ones on in the past that make me look like the terminator due to the unwanted shoulder excess. A classic reminder that over sized doesn’t always work and sometimes you’re left laughing at yourself in the changing room mirror. Also, you can’t see here but I just have on m trusty Topshop ‘Margot’ boots that are just really great black pointed boots. They don’t stock them anymore but I’m hoping they will bring them out again for autumn/winter or perhaps release some even nicer ones. I’m becoming a bit cartoon character esque in the sense that I always wear the same boots but they really are just a dream shape/fit. You can view them in my previous post along with a link to some similar – let me know what else you’d like to see on here or if there’s any features I could improve on to make it more readable/aesthetically pleasing! And thank you to all of you who take the time to read my little blog and say nice things, It means a lot. This outfit is really pretty, I hadn’t heard of We are Cow before, they have some really cool stuff!